Opioid use during pregnancy has increased dramatically in the U.S. over the past decade, leading to a surge in cases of neonatal abstinence syndrome (NAS) – babies born dependent on opioids. 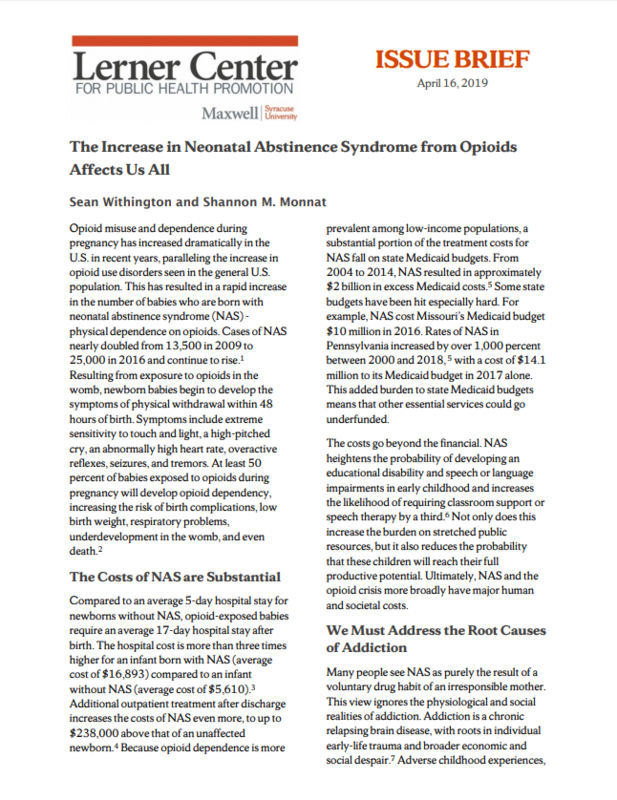 This issue brief discusses the impacts of neonatal abstinence syndrome (NAS) and ways we can address this important population health problem. Measles cases in the U.S. have soared over the past two years. 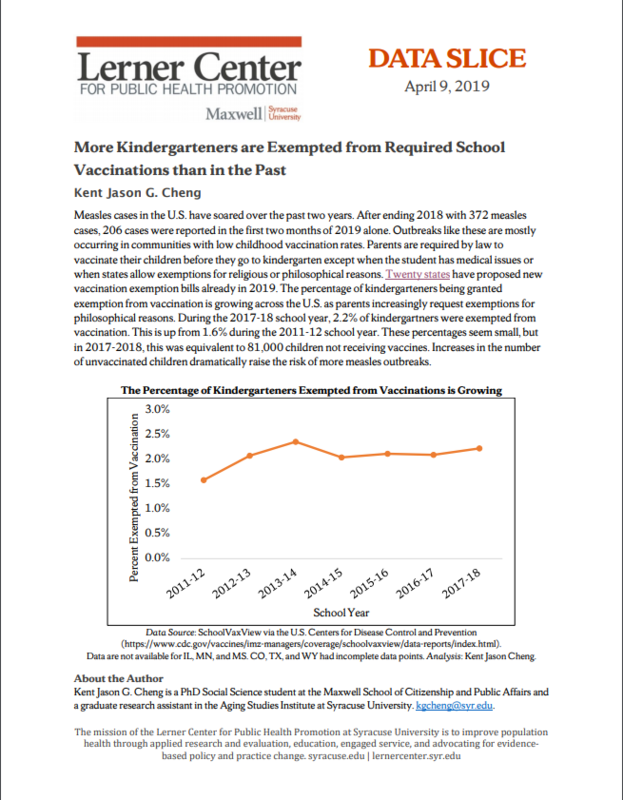 Yet 20 states have proposed new bills that would allow parents to exempt their children from vaccinations required to enter kindergarten for philosophical reasons. This data slice illustrates the increase in vaccine exemptions over the past several years and discusses the implications for new measles outbreaks. Diabetes is an urgent public health problem in the U.S., with 30.3 million people currently diagnosed with Type 2 diabetes. 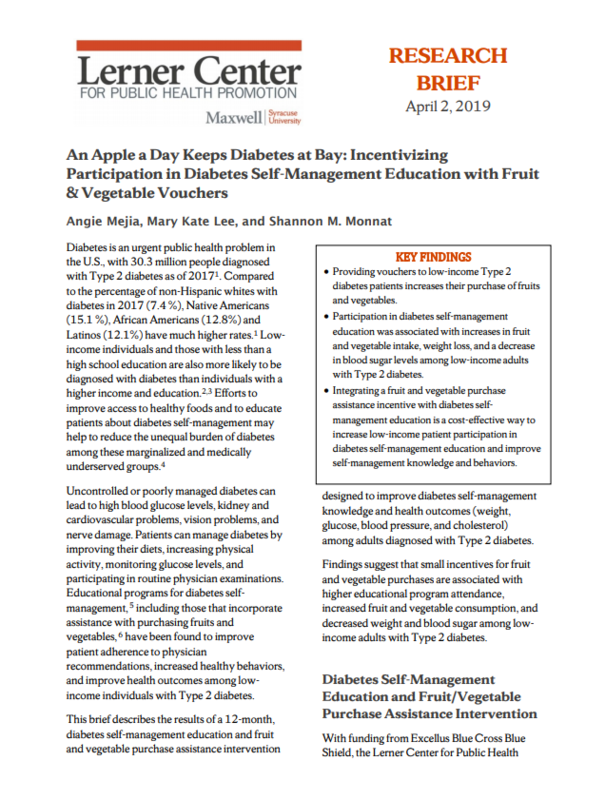 This research brief describes the results of a 12-month, diabetes self-management education and fruit and vegetable purchase assistance intervention designed to improve diabetes self-management knowledge and health outcomes (weight, glucose, blood pressure, and cholesterol) among adults diagnosed with Type 2 diabetes. People are more likely to view Monday as a day for a fresh start than any other day of the week. 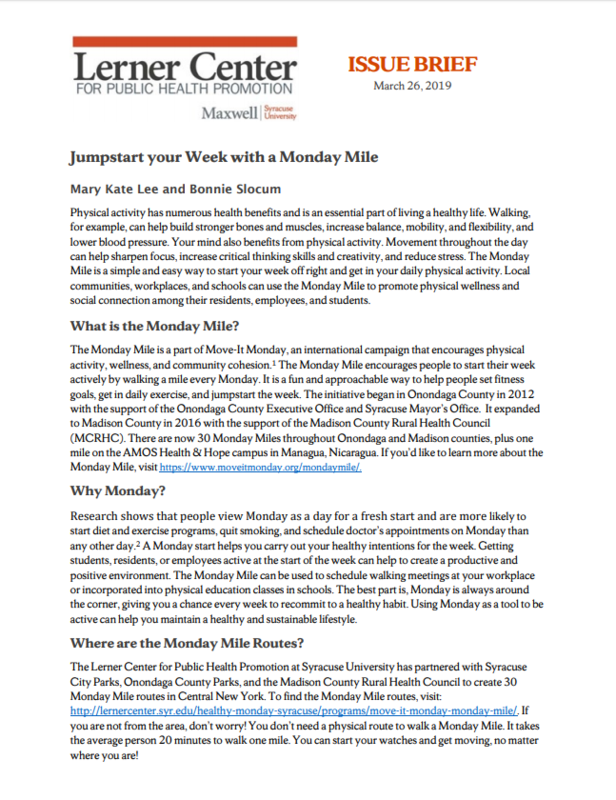 This brief discusses the benefits of kick starting your week with a Monday Mile, profiles a local community that created several Monday Mile routes where local residents can interact and be active, and describes how you can create Monday Mile routes within your own community. Suicide Rates Have Soared among Middle-Aged White Women in the U.S. 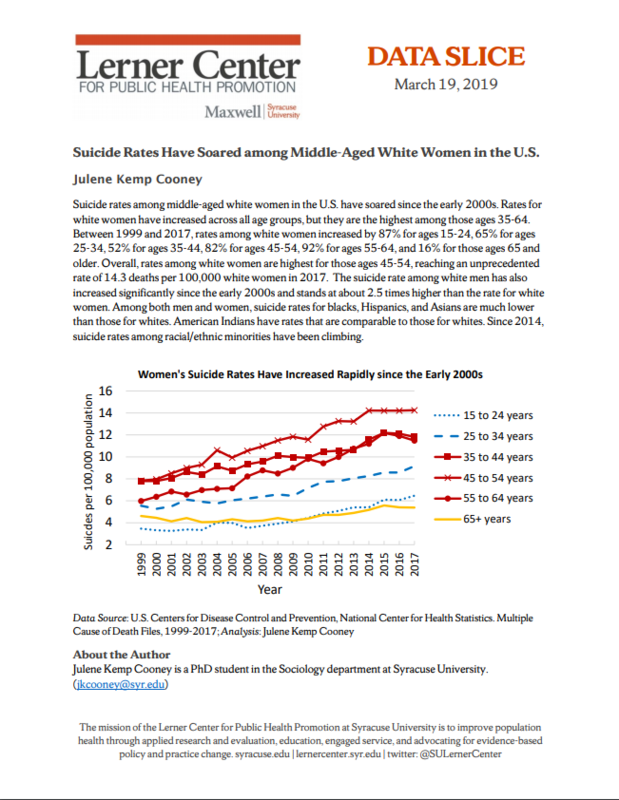 Suicide rates among middle-aged white women in the U.S. have soared since the early 2000s. Rates for white women have increased across all age groups, but they are the highest among those ages 35-64. 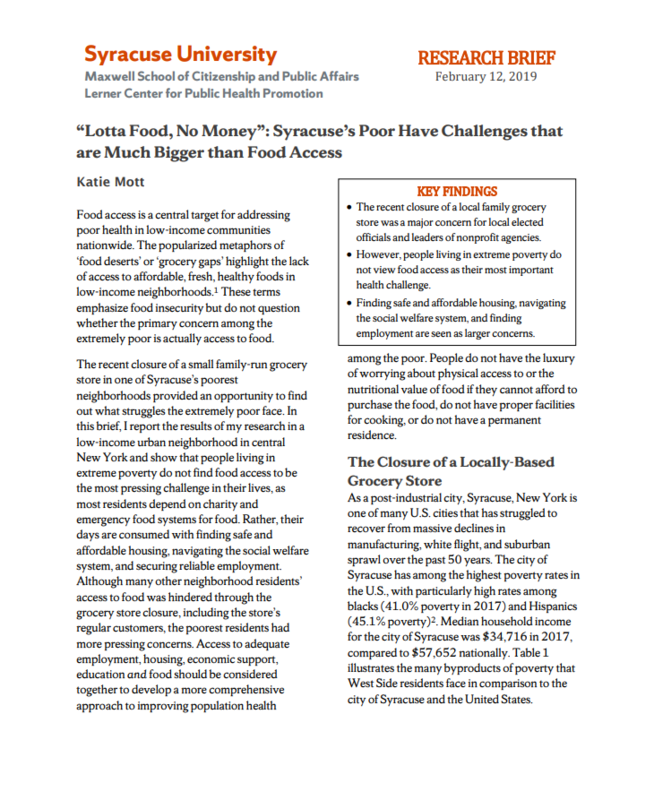 This data slice, written by Sociology PhD student Julene Kemp Cooney, describes these recent trends. Over 70,000 people in the U.S. died from drug overdoses last year. The U.S. has consistently struggled with how to address drug crises throughout its history and has not embraced harm reduction strategies that have proven to be effective at reducing drug overdose rates in other countries. 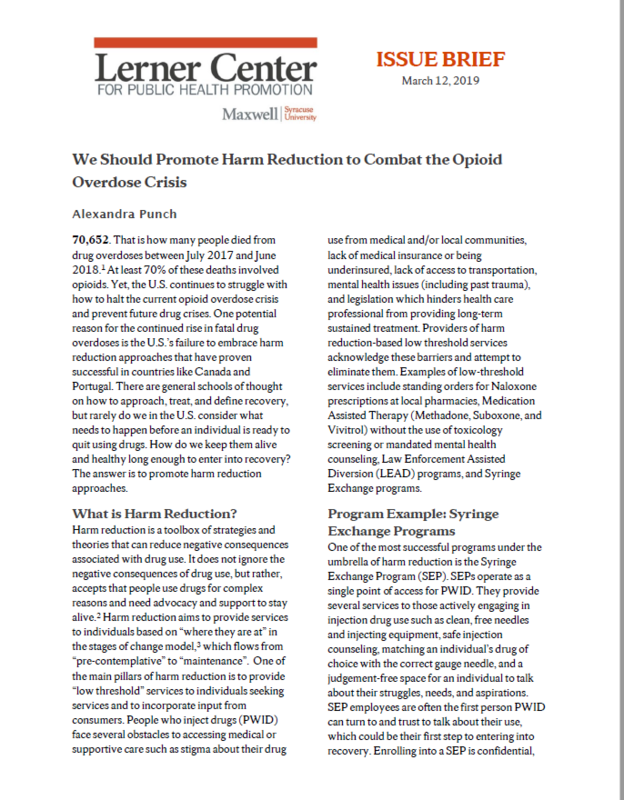 This issue brief explains the concept of harm reduction, describes various types of programs that fall under the harm reduction model, and discusses the promises these approaches hold for helping to combat the current opioid crisis. 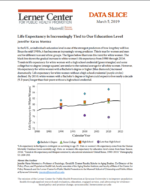 This Lerner Center data slice describes the growing gap in life expectancy between adults with a college degree versus those with less than college education. 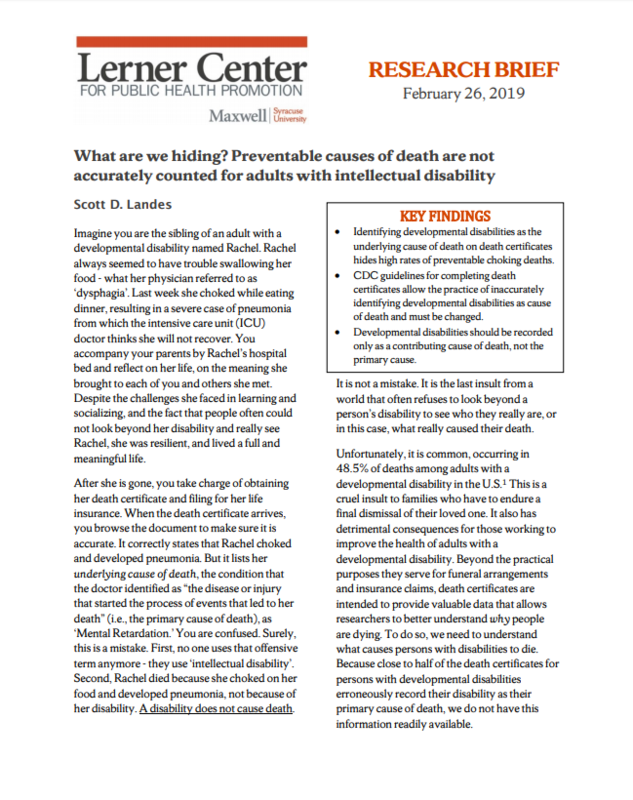 Nearly half of deaths among individuals with disabilities are coded as being directly caused by an intellectual disability. As a result, medical professionals are under-counting deaths due to accidental choking, heart disease, and other external causes among individuals with disabilities. 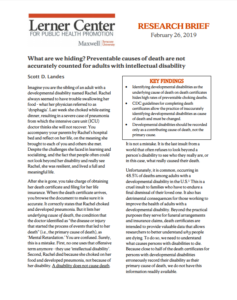 Recording deaths as being caused by a disability, in the presence of more direct causes of death, hides an unacceptably high rate of preventable choking deaths among adults with developmental disability. 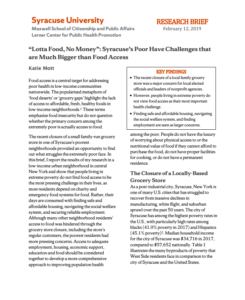 This brief takes an up close look at the issue of poverty and food insecurity in the City of Syracuse following the closure of a popular neighborhood grocery store and finds that—despite the attention given to the impact of so-called ‘food deserts’ on the health of poor families—the issue of food access is not the most pressing concern for the City’s poorest residents.